Be happy Kids! 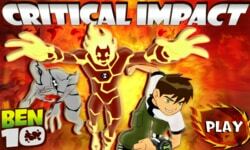 Ben 10 Critical Impact with its latest edition is here! Oh my God! The situation is dreadful, our planet is under threat as the critical meteor shower is on its way. Hurry up Ben 10, save the earth from this disaster. This is you Ben who can do this mission. Don’t be late. The game Ben 10 Critical Impact features two aliens Heatblast and Ghostfreak from the Ben 10 Alien Force Series. It is an adventure game to play online. As well you can download it for free. Meteors are falling continuously. Try to destroy them before they reach the ground. Before playing let’s take a look at gameplay so you can find best tips for you! 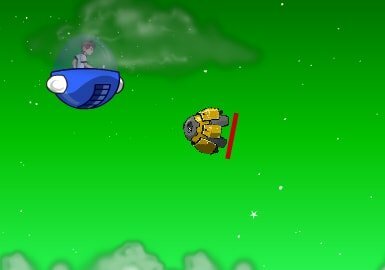 The main objective of this game is to destroy falling meteors. How can Ben do this alone? Don’t worry! Ben is master of all these things. He can turn himself into Heatblast and throw fireballs toward meteors to destroy them. But there is falling trees and rocks in his way. How will he pass these obstacles? Again there is some help for Ben. He can turn himself into Ghostfreak to pass these obstacles. Be careful about your health. The indicators Fire Meter and Health Meter are shown at the top right corner of the screen. Fire meter indicates your firepower as Heatblast. When you increase firing. The meter shows the reduction of firepower. Whereas Health meter indicates Ben’s Health the health meter will go down if the meteors start hitting the ground. Now it's show time! Go and play this amazing game.